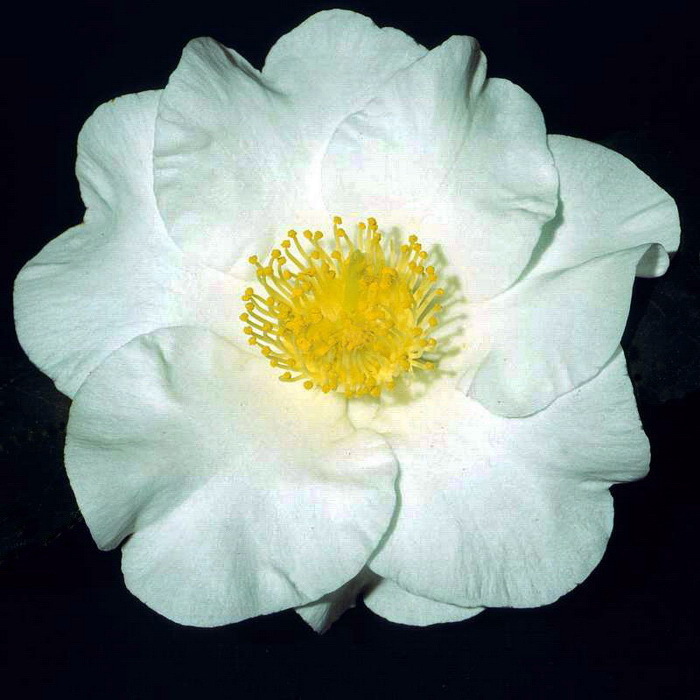 Gallery - Species — Camellias Victoria Inc.
Creamy white, but peach pink in bud, cup shaped, petaloid semi-double to open peony form, 7-8.5cm across with 13-20 large petals and an open centre of petaloids with yellow filaments, stamens and a few erect and twisted small petals. Originated in Japan in 1967. Red, 3 1/2 inches - 4 1/2 inches, funnel shaped. Leaves are large serrated on upper half of margin. Originated from Southern China. It was collected in Fujian province in 1861 by C.F.M. de Grijs - presumably a native of the Netherlands. The 5cm wide flowers are borne singly at the branch tips. The leaves are medium sized, narrowed abruptly at the apex into a slender point and of leathery texture. Orchid pink frosted lighter in the centre. Medium, single bloom. Upright growth. Fragrant, small white flowers, leaves small, sharp pointed, elliptic to oblong 1 1/4 inches x 1/2 inch. A shrub growing to 10 feet. Ryukyu Islands, Japan. A species from the mountains of western China, C Mairei is rather similar to the bettern known C. Saluenensis from that same region, differing in its smaller flowers and leaves narrowed into a finer pointed apex. Flower colour varies from bright red through shades of pink to white and the 1 1/2 in/4cm wide flowers have 7-8 petals. It can grow into a small tree with age. This species from southwestern and central China is closely allied to C. reticulata, from which it differs in its smaller blooms and leaves. Flower colour varies from white though soft, delicate pinks to deep pink. Puniceiflora means reddish purple-flowered, which sounds exciting but seems to have been based on a misapprehension, perhaps arising from dried specimens, since this recently named species from southeastern China has pink flowers. These are smallish, about 2 1/2 inches/6cm wide, with 5-6 petals and appear at the branch tips and in upper leaf axils. The dark green leaves are neatly elliptical and only 1 1/2 - 2 inches/4-5 cm long. C puniceflora is a shrub up to 2 metres/6 ft tall of compact growth. The rose flowered camellia was introduced to the West from a Chinese nursery in the 1850s and was for a time quite popular in England. It was originally surmised to be of cultivated origin rather than a true wild species, but Chinese botanists now say it occurs wild in Sichuan, Hubei, Jiangsu and Zhejiang provinces. Leaves are 3 inches/7.5cm long and small funnel shaped flowers, borne in leaf axils on short stalks, are soft rose-pink to reddish pink, only 1 inch/2.5cm wide. Small, single pink flower. A weeping form of C. rosiflora. Originated by Nuccio’s Nurseries, Altadena, California, USA in 1982. The willow genus Salix gives its name to this species from subtropical south China, on account of its weeping habit and unusually narrow leaves; these are about 3 inches/7.5 cm long but only 1/2 inch/1 cm wide. The twigs also are clothed in long hairs. White flowers are in ones or twos in the leaf axils, about 3/4 inch/2 cm in diameter with 5-6 white petals. C. salicifolia was first found on Hong Kong island in the 1850s; it can still be seen growing beside the footpath around the Peak. White flowers with buds tinted red, very small, leaves narrow and tapering to a blunt apex, 1 1/2 inches x 1/2 inch. A shrub growing into a small tree. Formosa.